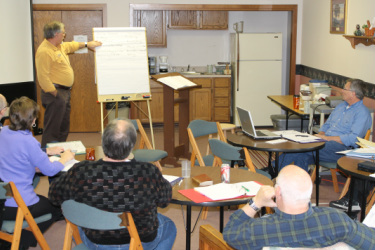 Transitional Ministry Training is a joint venture of the trainers and Amigo Centre, in consultation with Mennonite Church USA and the four Great Lakes area conferences. Registration requires a letter of recommendation for training from a conference minister, and the completion of a two hour interview prior to the training event. The individually arranged interview attempts to determine the extent to which the candidate has specific characteristics which will contribute to effectiveness as a transitional minister. The intended outcome is greater self-understanding regarding the nature and demands of transitional ministry. Interview results help to establish learning goals for the event, and future professional development. Participants are encouraged to prepare by reading one of four recommended books. A list will accompany registration confirmation. In-depth instruction in the developmental and process tasks of transitional ministry is integrated with critical incident case study triads, and role playing. Extensive resources for transitional ministry are provided. Six meals, plus continental breakfasts and three nights lodging (if desired) at Amigo Centre.